The model illustrates the smooth function that establishes the relationship between two directions (orientated 45º to one another in the example), in three dimensions, simultaneously. It involves synchronous quantification of direction, from any single event, which can be understood as simultaneous finite rotations which commute in much the same manner as infinitesimal rotations commute in conventional plane geometry. This differs (mathematically and conceptually) from the usual (two dimensional) discrete finite rotations or infinitesimal rotations which are used to manipulate objects in Euclidean 3-space. The methods and solutions presented in this section have not been verified. The two planes that remain stationary in the animation each contain SO and a line tangent to circle C. For tan-colored plane this tangent is at (-r,0,0) and for magenta-colored plane it is at SN which is also (r,0,0). Because these two planes contain the center of the sphere, which need not be in the xy-plane, these stationary planes are not parallel to, or perpendicular to, the xy-plane except for when r is at either limit r = 0, or r = 1. The point on C where 3 moving planes intersect is P. Blue-colored plane contains SO and a line tangent to the circle at point P. The animation starts with P at (r,0,0) and then moves P along a 180º arc of circle C.
Green-colored plane contains the point P and pivots about an axis as P moves, but this axis is not one of the coordinate axes. It is an axis defined by a line containing the line segment from SO to SN, which is the main or cardinal axis of sphere S.
Yellow-colored plane (or light green) contains points SO and P, and is perpendicular to . Plane can be considered the longitude plane because the great circle made by its intersection with sphere S is always a line of longitude. Plane can be considered the tangent plane since it always contains a line tangent to circle C at point P. The dihedral angle between planes and is angle , the angle of interest. Plane can be considered the elevation plane and it stays perpendicular to plane and passes through sphere center SO and point P. The smallest angle between the cardinal axis of the sphere and plane is angle , or ∠SNSOP. Point P can be defined as an arc length along circle C equal to angle , or ∠SNCOP. 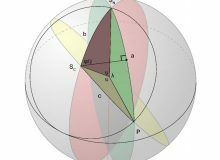 The angle between the axis of cone N and the cardinal axis of sphere S is angle , or ∠SNSOCO. The objective is to define a family of functions which are based on different values of , and which express α as a function of . The approach will be to find and , each as a function of . 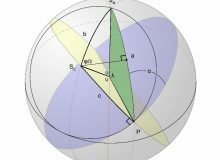 One of the methods used here will be to solve a spherical isosceles triangle using spherical trigonometry. At the top right corner of the animation there is a set of numbers representing that change between 0° and 90°, while below them, in the rectangular box, there is another set of numbers representing that also change between 0° and 90°. 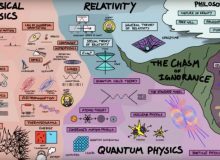 The mathematical model used for the animation defines a specific member of a family of functions. The z-coordinate for the center of sphere S defines which member of the family we are analyzing. The model shows as a function of with angle equal to 45°, or z = . 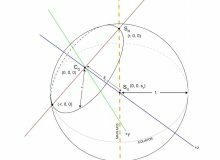 = angle between the axis of cone N and the cardinal axis of sphere S = ∠SNSOCO.